Optical Nomenclature used in this database. The value of the index of refraction can be calculated using chemical and physical property data if these values are missing. The practice of using the Gladstone-Dale relationship to minerals only gives an approximation because of the effects that different crystal systems have on the anisotropy of the crystal lattice and the resultant values of n (index of refraction). The value of KP may be estimated from the value of Kc, the value of the Gladstone-Dale constant derived from the chemical composition. kc = Gladstone-Dale constant of chemical phase "n"
kp = Percentage of the chemical phase "n"
Uniaxial Minerals: Birefringence = abs(NO - NE). Biaxial Minerals: Birefringence = NZ - NX. 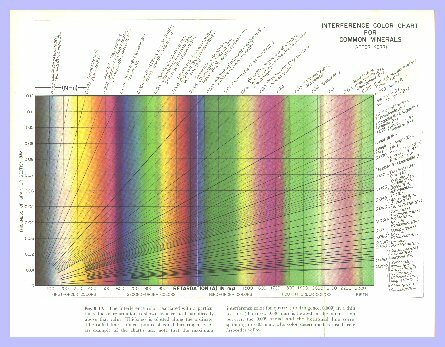 Birefringence can also be estimated from a color interference chart for colors observed under crossed polarizers on a petrographic microscope. 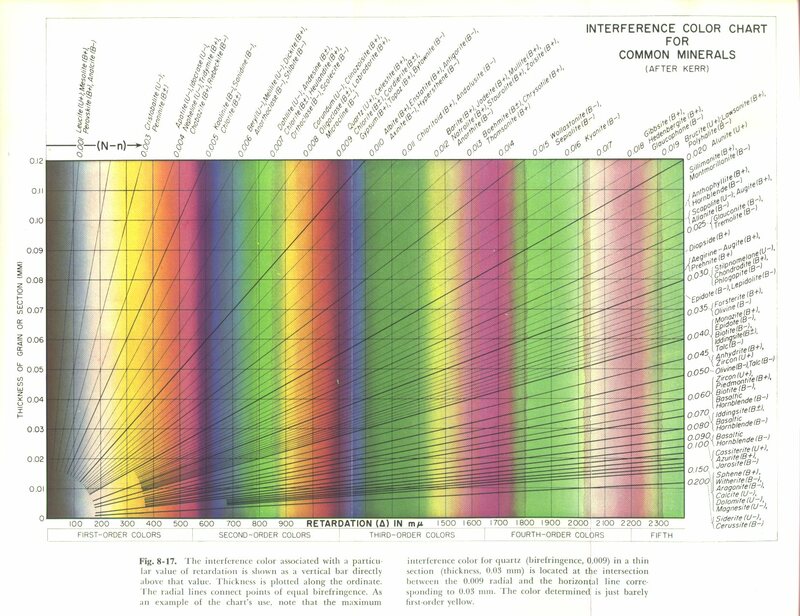 The interference color chart is from Bloss, 1962, fig. 8-17. Click on the image for a larger picture. Dispersion is defined as the separation of a ray or beam of white light into its component colors. The common example is the separation due to a glass prism into the colors of the rainbow. Dispersion can be measured by calculating the index of refraction at different wavelengths. High dispersion materials separate the colors more effectively then low dispersion materials. High dispersion provides the "fire" in gemstones. Low dispersion materials are desirable in optical lenses. In the special case of biaxial minerals, dispersion is noted by the color fringing in acute bisectrix figures using a petrographic microscope. This fringing is due to the variation of the refractive indices of α, β, and γ (Nx, Ny, Nz) with respect to wavelength. The net result is the variation of 2V angle with wavelength. This is represented by the relative position of 2Vr for red light and 2Vv for violet light on the opposite ends of the visible spectrum. This is shortened to r and v.
When 2Vr is less than 2Vv then it is noted as r < v.
When 2Vr is greater than 2Vv then it is noted as r > v.
Example: biaxial1.7* finds all biaxial minerals with the lowest index of refraction 1.7 to 1.79. Example: biaxial1.7* bire=0.015* pleochroism "pale blue" finds all biaxial minerals with the lowest index of refraction from 1.7 to 1.799, a birefringence of 0.0150 to 10159 and a pale blue pleochroism. Example: uniaxial1.6* finds all uniaxial minerals with the lowest index of refraction 1.6 to 1.69. Example: isotropic1.5* finds all isotropic minerals with the lowest index of refraction 1.5 to 1.59.